Geez, I thought people in Winnipeg were nice people. But it turns out they’re no different than a couple of people in other cities. Surprisingly, some Winnipeggers don’t like the Habs. I don’t understand it, but it’s the way of the world, I suppose. Who would’ve thought? So I say to these Winnipeg Hab-haters, may one of your smaller mosquitos land on your head, pick you up by the hair, and drop you into a haystack with a pitchfork in it. This message is directed to the most overrated, over-hyped and probably whiniest bunch of sore losers, along with their fans. To the Montreal Canadiens: Na, na, na, na, hey, hey, good riddance. And take your homer referees with you. Ole, ole. Nigel Gauvreau needs to calm down and take a look outside the real world (Mail Bag, May 3). No one cares about Montreal winning the Cup, and all Habs fans have to show for during the past 15 years is that they nearly burned down the city when they beat Boston. Since the same thing happened back when Rocket Richard was suspended, that’s nothing new. Besides, at least the Leafs are looking for a GM who will turn them into a Stanley Cup contender. The best thing about the Montreal Canadiens being knocked out of the playoffs will be not having to listen any longer to the Chairman of the Carey Price fan club, CBC’s Greg Millen. Don Cherry got ripped for pulling for the Leafs or Bruins, but at least if you’re annoyed with Grapes’ views, one has to hear him for only a few minutes at a time. But Millen goes on for 60 minutes about the Canadiens goalie and his great positioning and rebound control and seems to be over the top with gushing compliments on simple wrist shots from the blue line. Even without high-definition, one could see the No. 31 Habs sweater under his CBC blazer. Don’t get me wrong, Price is a great young goalie with potentially a great future ahead of him, whom 29 other teams would covet. But Millen, having been only an average NHL goaltender himself, seemed to be living vicariously through the young Montreal netminder. And when Price began contributing more and more to the Canadiens’ losses and eventual elimination, Millen only then realized the real star of the series was the Flyers’ RJ Umberger, a fourth-line player who almost didn’t crack the playoff roster, and then began to sing his praise deservedly. I’m sorry, but Ted Lindsay’s 82 years old now, and so some of his reality must have packed it in. Vladimir Konstantinov was a better defenceman than Bobby Orr? Sorry, Ted. No one was better than Bobby Orr. And he says Doug Harvey was the greatest ever before Konstantinov but didn’t have the bodychecking ability Konstantinov had? Harvey could not only bodycheck with the best of them in an era when bodychecking was much more prevalent than in the modern game, but players from the other original five teams knew they’d better not mess with Harvey because he was big, strong, mean, and an amateur boxer. Good for Ted Lindsay for testifing during the accident lawsuit. He means well. But Konstantinov was no Bobby Orr, and no Doug Harvey. These two controlled the game. Everyone else comes in second. The following are excerpts from Lindsay’s testimony, published in the Detroit News and Detroit Free Press. May 12, Detroit News: “He was the greatest machine in the world,” Lindsay told the jury of five men and three women. Today, “I see this vegetable and to me it just kind of makes me sick (compared) to what was the greatest hockey player in the world. It’s a shame.”Lindsay said he continued to work out in the Red Wings weight room following his hockey career and became good friends with Konstantinov and other team members. He described Konstantinov as “a gifted person,” a skilled bodychecker who was a magnificent skater and had the ability to go up ice and act as a fourth forward and still get back across his own blue line in time to defend. Lindsay said Doug Harvey of the Montreal Canadiens was the greatest defenseman he ever saw before Konstantinov, but “Doug didn’t have the gift of Vladi with the bodychecking.” The only other defenseman he compared Konstantinov to was Bobby Orr of the Boston Bruins, whom Lindsay said was a great skater who again was not as physical as Konstantinov. Lindsay said he understood the chauffeur had been unable to keep the limousine on the road. “People like that, they should be shot,” he said. May 12, Detroit Free Press: Hockey Hall of Famer Ted Lindsay testified today that the Red Wings easily could have won at least two — and perhaps five – more Stanley Cups if Vladimir Konstantinov hadn’t been disabled by 1997 limousine crash.”That’s how good he was,” Lindsay, 82, told a federal jury in Detroit considering a claim against Findlay Ford, the Ohio dealership that sold the limo to a metro Detroit company. “There was none better,” he said, adding that Konstantinov topped even the legendary Bobby Orr as a physical body-checking defenseman. When Pittsburgh star Evgeny Malkin skated in alone and surprised everyone by blasting his slapshot by Flyers’ goalie Martin Biron from only about ten feet out, I knew it was time to pull out my old scrapbook. 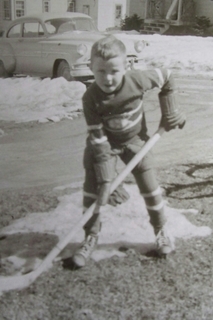 It was circa 1965, and Montreal speedster Bobby Rousseau, a slapshot specialist and off-season golf pro in Ste. Hyacinthe, Quebec, was awarded a penalty shot one night in a game against Boston. 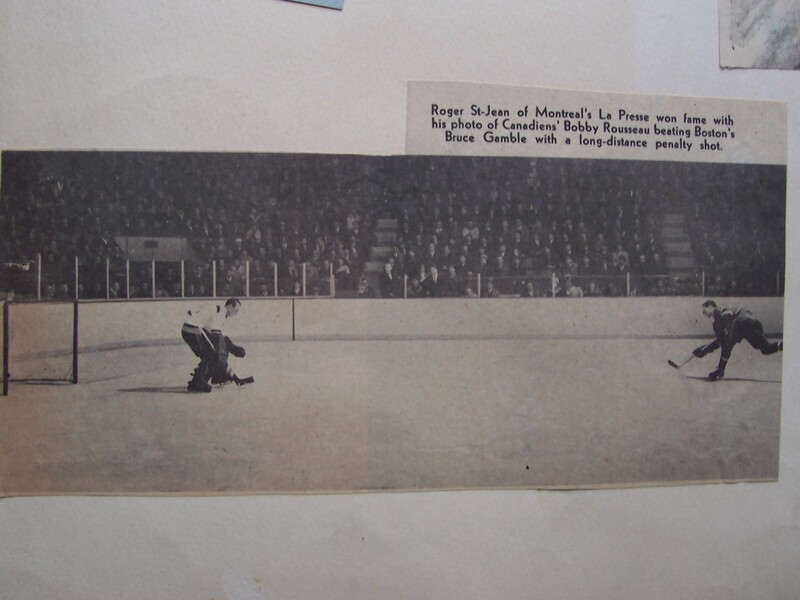 Rousseau grabbed the puck at centre ice, took it just inside the blueline, and to the surprise of everyone, including his coach Toe Blake and Boston goalie, Bruce Gamble, wound up, fired, and scored. Has a penalty shot or shootout goal ever been scored from so far out? I doubt it. So when you see breakaways next year, or all the shootouts and penalty shots, ask yourself why the players don’t just tee up and blast away every so often. The goalie is not in the least expecting it. Like Malkin did the other night. And like Bobby Rousseau did those many years ago. Rick the Trucker emailed me and told me the Bell Centre crowd started singing that wretched Ole song late in the game when the score was tied 4-4. And not long after the song started, the Flyers scored, of course. I’ve been saying it all year. I hate that song. I despise it. I cringe when I hear it. I think it pumps the other team up. If you know anyone who goes to games at the Bell Centre and sings this, please take them out to the country and throw them off a bridge. Or at the very least, rip their vocal cords out with a pair of pliers. Although there’s lots of good about the Montreal Canadiens, why did Philadelphia win? And why did Montreal almost blow the Boston series? Why aren’t they ready yet? Did Bob Gainey get rid of Cristobal Huet a little premature? Did the Habs burn out in the regular season going for the coveted first place overall? Did they go into the playoffs a little too cocky? Why did the defence disappear during the playoffs? Hamrlik, Komisarek Gorges, Bouillon, all solid as a rock beforehand, and too soft in the post season. And Andrei Markov, a premier defenceman in the league, didn’t play at all like a premier defenceman. What about Michael Ryder? Will he stay or will he go? He’s going to have to go. They didn’t want him in uniform in the playoffs, so why would they want him in uniform next year? Why did the big guns become quiet? Alex Kovalev played quite well, and so did Saku Koivu when he came back from injury. 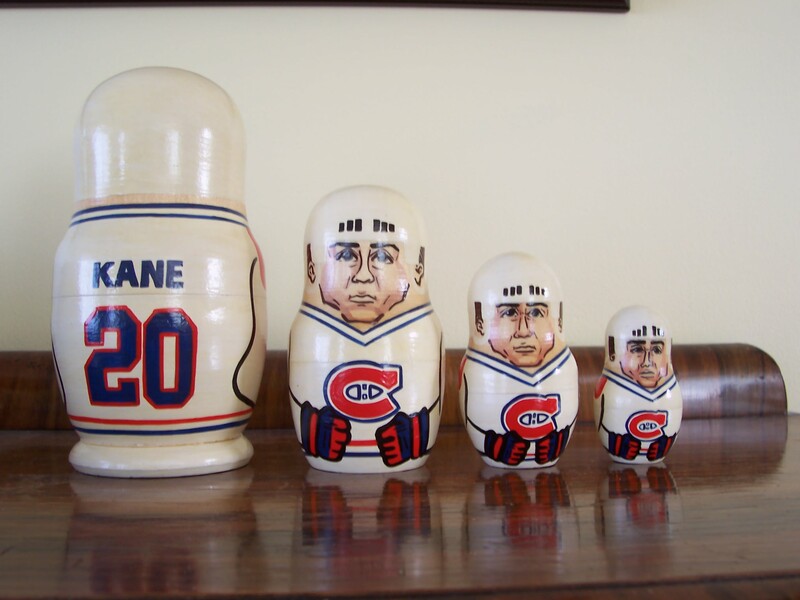 But what happened to the Kostitsyn’s, and Mark Streit, and Tomas Plekanec? Or Higgins and Latendresse? These were guys who turned it down a notch in the playoffs, and hopefully it was such an experience this year, that next year, they’ll turn it up a notch. Will I be chosen as flag guy at the Bell Centre next year? Will Danielleia stay a Habs fan? Will der Habinator buy a new computer? Will Mike continue to experience ups and downs as an elevator mechanic? Man, those Flyers fans are a tough crowd. They’re letting me have it in the comments section. So I’ve done what I had to do. I’ve prayed to the man above to help, to give me guidance, to make me strong against these folk in Pennsylvania who are rubbing their hands in glee at this very moment at the thought of their team taking out my team. Flyers fans drink too much. When they give a urine sample, there’s olives in it. Flyers fans take viagra and prune juice. They don’t know whether they’re coming or going. They asked Flyers fans to be poster boys – for birth control. Martin Biron’s mother had morning sickness after he was born. The Flyers complained to their psychiatrist that everyone hates them. He said they were being ridiculous – everyone hasn’t met them yet. When Daniel Briere was a kid his parents moved a lot. But he always found them. When Derian Hatcher was born, the doctor slapped his mother. They don’t feel their team is getting enough respect. They’re complaining that when I write about Montreal losing, it’s not because the Flyers played well, it’s because the Habs played poorly. And they don’t think I’m giving enough credit to Martin Biron. So I’ve been thinking about this. And really, the big reason Philly is doing so well is because of Martin Biron. It’s not because the Flyers are on fire. Daniel Biron’s been good but not great, and also RJ Umberger. But Mike Richards hasn’t, or most of the Flyers forwards, for that matter. And whatever John Stevens did to make his defence so tight around their net, it’s really working. The reason I say Montreal is not playing up to their standards is because they’re not. They won the eastern division, they scored more goals during the regular season than any other team in the league. And their power play was the best in the league. They played fire wagon hockey all year, they were dynamic, fast, and were a handful for others teams on most nights. During these playoffs, their power play has fizzled and their scoring in general is way off, and that includes the Boston series also. The guys who lit it up during the season, the Kostitsyn’s, Higgins, Kovalev, Plekanec, are quiet now. I don’t know why these fans have a problem with this thinking. And one last little thing. After Philadelphia scored late a couple of games ago, Flyers defenceman Kimmo Timonen turned around and laughed in Tom Kostopoulos’ face. This is the kind of thing that turns off most hockey fans. It lacked class, you don’t see this type of mocking often, and when Kostopoulos smacked him in the mouth for this, I’m sure hockey fans, even Habs haters, nodded their heads approvingly. City Hall in Philadelphia, if it’s still in the same place as it was in 1969, has stairs up to the top where you can look out over the street and smoke a joint. That’s what Mike and I did on our way to the Atlantic City Pop Festival way back then. WC Fields’ proposed epitaph was “All thing’s considered, I’d rather be living in Philadelphia.” Sounds a lot like Daniel Briere. Except Fields was talking about dying. Philadephia is the home of legendary hockey players – Dave Schult, Don Saleski, Bob Kelly, Moose Dupont, Steve Downie, and the guy who broke ankles better than anybody in the game, Bobby Clarke. “Rocky” was filmed in Philadelphia. The movie included quite a few shots of the some of the nicer parts of the city. A meat slaughterhouse, guys out on the street, freezing, and standing around fires burning in tin cans, singing a capello, Rocky’s (Sylvester Stallone) lovely bungalow and neighbourhood, and a sweaty old gym. Philadephia is the home of the Philadephia Phillies mascot, the Philly Phanatic. You’ve probably seen him. You know, the creature with the ridiculously long nose, extended neck, and gangly, weird body. And there’s absolutely no truth to the rumour that the Phanatic was actually Don Saleski in the off-season. The Phanatic was apparently quite upset about these allegations. “There’s no way I look as silly as Don Saleski,” stated the creature. Two games were played tonight. The one Bob Cole saw, which was Philadelphia all over Montreal most of the game. And the one the rest of us saw, which was a couple of posts hit by Montreal, a penalty shot, a shorthanded goal by Kovalev, a couple of comebacks, overtime, a dramatic goal by ultimate warrior Tom Kostopoulos, and a pretty tip-in by Patrice Brisebois, which was, unfortunately, into his own net. It wasn’t great, but it wasn’t what Bob Cole saw either. It was a lip-smacking 4-3 overtime win for the Canadiens. A late comeback, and then the Kostopoulos goal 48 seconds into the extra period. Yes, that Tom Kostopoulos, the one fans pooh-poohed when he came over from Los Angeles. Everybody wanted a star like Vincent Lecavalier or Daniel Briere, but had to settle for a plumber these fans labelled Krustyopolos, and everyone wanted to lynch Bob Gainey for this lacklustre signing. And then some guy on some French TV show used profanity when describing Kostopoulos, and said a French player should be playing, not Kostopoulos. Thankfully, the guy was later fired for his rude and tasteless comments. Tom Kostopoulos is as important as any player on the Montreal Canadiens. Every great team has had players like him in defining roles. About those two kids dressed in their Habs uniforms, holding flags and skating around the Bell Centre at the beginning. HOW THE HELL DID THEY GET THIS GIG? I need to do this. Can an old guy do this too? If Club de Hockey Canadien needs to be paid, I’ll sell the house. Please call. I can be there in twelve hours.